Enjoy a more comfortable, energy-efficient home with rebates up to $1,250. Dominion Energy Ohio’s Home Performance with ENERGY STAR Program takes a comprehensive approach to help boost your home’s comfort and long-term value, while keeping your energy bills in check. Starting with a home energy assessment, your entire home will be evaluated as one interconnected system to understand exactly how it’s using—and wasting—energy. To schedule your home energy assessment, complete the form below or call 877.287.3416. Looking to get the most out of your assessment this year? For just $100* we will upgrade your assessment to include the installation of a Nest Thermostat E.
*Additional Nest Thermostat E units may be purchased for $75/per thermostat installed to replace already existing thermostats. 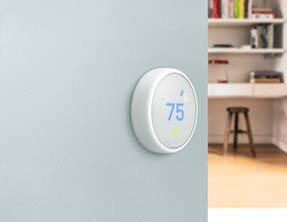 Discounted assessments are not available when participating in the 2019 Nest Thermostat E promotion. To schedule your home energy assessment, call 877.287.3416 or complete the form below and click submit. One of our friendly representatives will contact you to schedule your assessment. The Dominion Energy Ohio Home Performance with ENERGY STAR Program is offered on a first-come, first-served basis and is available until annual funding is expended or the Program is discontinued by the Public Utilities Commission of Ohio. The Program is funded by Ohio utility customers and is administered by CLEAResult, on behalf of Dominion Energy Ohio. Be a residential Dominion Energy Ohio customer with an active account in an individually metered, single-family, or multi-family dwelling with no more than 4 individually metered units. Have natural gas as the residence’s primary heating source. Not be on the Percentage of Income Payment Plan Plus (PIPP Plus), and/or not be eligible for the Home Energy Assistance Program (HEAP). Refer to PIPP/HEAP income guidelines. Not have completed a home energy assessment through Dominion Energy Ohio’s Home Performance with ENERGY STAR Program, or received weatherization assistance through Dominion Energy Ohio’s Housewarming Program in the last 5 years. Use a CLEAResult qualified auditor for the assessment and a participating contractor when making the recommended improvements in order to qualify for rebates through the Program. Improvements must be recommended as a result of the home energy assessment. Participating contractor must install Contractor-Installed measures. Customer can install Do-It-Yourself (DIY) installed measures. Improvements must meet the Program’s minimum requirements for the measure. The total combined rebate amount must be at least $75, but no more than the $1,250 maximum. Rebate Application must be received by CLEAResult within one (1) year from the date of the home energy assessment and no greater than ninety (90) days from the date of completion of work. Before leaving your home, our auditor will provide you with a list of participating contractors and guide you through the Contractor-Installed, Contractor-Installed Emergency and Do-It-Yourself measures and rebates available for each project. * Annual Fuel Utilization Efficiency (AFUE) is a thermal efficiency measure of combustion equipment like furnaces, boilers, and water heaters. A furnace AFUE rating allows customers to assess how much heat their unit will generate over an average year versus the amount of energy it will consume. To schedule your Home Performance Energy Assessment, complete the form above or call 877.287.3416. Additional program details and eligibility requirements are available. ©2019 Dominion. All Rights Reserved.